"May your hearts be blessed with love, may your spirits sing in tune, may the moments you're together, be like flowers in full bloom. May you nurture in each other understanding of yourselves; may you sing and dance with freedom wings, and hear the holy bells. May god support and guide you as you open to your love; may you soar to that place inside you where there waits a golden dove. May the peace you find together spread through grace across the land; may each heart that hears your laughter awaken as it can. May these things to you be granted as it is for the highest good; and may all the gifts you're given be returned a hundredfold." 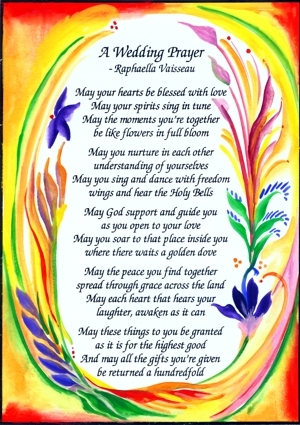 5x7 Poster of Raphaella Vaisseau's original blessing, "A Wedding Prayer". This inspirational prayer is a nondenominational spiritual blessing and is a perfect wedding gift for couples of any faith. It was read by the father of the bride at the wedding of Jimmy Carter's grandson in 2001. It's also available in the first person as "A Prayer For Us" which acts as an affirmation for couples. Love each other passionately. Be yourself. Share. Express.